AWSurveys Reviews - Legit or Scam? AWSurveys Reviews – Legit or Scam? AWSurveys is a get paid to take surveys site that’s been around for a long time. The company describes itself as a new survey experience and claims to have over 2 million survey takers in their database. They position themselves as more of a user testing site than a traditional survey company. Essentially saying that as a member you will be tasked with evaluating websites, and as a company you can get useful feedback about your business. When you first sign up with AWSurveys.com they have a series of welcome surveys that are quick and easy to take and will generate you approximately $27 in a short time. When you do get offered a website evaluation you will have to leave reviews of at least 2-3 sentences. The company makes payments every Monday and Thursday with Paypal.com or Payza.com. You will have to pay the associated fees and must have a balance of over $15. Unlike many other survey companies what sets AW Surveys apart is that they are open to the global population. Most established survey sites only accept members from the US, UK, and CA. Some members have reported that AW refused to pay them for their completed surveys and referrals. AWSurveys sends notifications that accounts are closed due to a violation of their terms of service. Simply, they are alleging that these users have signed up fraudulent accounts and are trying to game the system. Now, this is actually a genuine problem that AW Surveys and other survey companies face. There are some websites found online that claim to show you how to hack AWSurveys and get payments out of them without doing any work. The problem is that often times innocent people get caught up in these safety measures and have their accounts terminated for no reason. 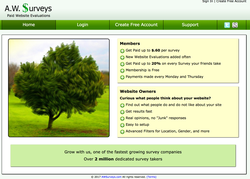 AWSurveys is an older company and were new and innovating when they first launched. However since then there have been new companies using upgraded technology and providing Unique opportunities for people to view ads or take surveys in exchange for money. Check out our full list of Survey Sites to see what other market research sites are available. If you have used AW Surveys please leave a detailed review below and let our members know if it was worth your time. Average Rating for " AWSurveys " is 2.2 out of 5 based on 5 reviews. it is totally fake and waste of time. I heard that the website now changed to $15 dollar payout limit. Haven't gotten mine since I am at $5. It still takes some/a lot of time to get that $15. I joined, completed a few site reviews, referred a friend, account got deleted automatically after a few days. It's a good website for idle sitters who want to earn money without investing a single penny.